Planning a trip to any country requires detailed preparation. One of the things one must take care of is transportation. When going to Israel, one can count on taxis, as they are a very popular way of transportation. Many people in Israel do not own a car, and taking a ride by bus doesn’t fit their schedule, so they turn to taxis. The taxis are all modern cars, safe, and with reasonable, not only for locals, but tourists as well. Some of the tourists find taxis in Israel quite cheap compared to the European or American ones. What one must be aware of is that unlike elsewhere, taxis in Israel use meters or have fixed fare charging, depending on the area or tourists’ preference. Some additional charges can be expected as well. Once in Israel, it is impossible to avoid rip-off taxis; like in any other country, it is possible that some of them will try to charge an unreasonable price if fixed fare is chosen by a tourist. Many tourists who have been to Israel suggest using meters in order to avoid such a situation. 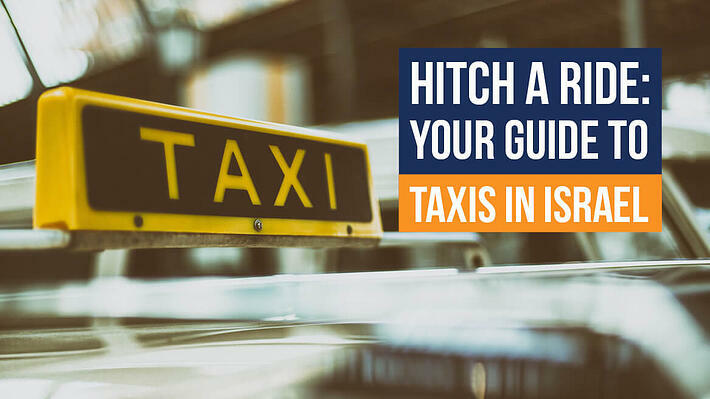 If you have an escorted tour arranged with Gil Travel, on your own or as a part of some tour packages, here are a few tips for using a taxi during your trip in a case you need one. In bigger city areas, like Jerusalem and Tel Aviv, taxi apps are available in a few languages, Hebrew, English and Russian. Some of the most popular include Gettaxi and Uber. Using taxi apps is quite convenient; you can save time since there’s no waiting and you can track your taxi’s arrival. Another benefit of using taxi apps is rating taxi drivers. - you can receive a receipt by email. Once in Israel, you might notice how the custom of catching a cab is different than the one of the country you come from. One of the first differences you’ll notice is that taxis in Israel don’t have a light system. No, there is no light that helps you know if it’s occupied or not. Just reach outwards and point down towards the curb or street. The one that is unoccupied will stop. Do not expect to see yellow cabs all around Israel. Taxi colors here are a bit different. In west Jerusalem and the remainder of the country, taxis are white, and in east Jerusalem you will find yellow ones. If you prefer ordering a taxi rather than getting one on the street, there are several options to do that. You can call local cab companies and order one. Sounds easy, but it’s not. This option comes with its flaws - you might have a hard time ordering if you don’t speak Hebrew. Do not expect English speakers on the other side of the line. However, you can try to find someone who will call them and order a cab for you. Another option is the taxi station. Almost all hotels have a taxi station nearby, so getting one there will not be a problem. In Israel, there are two ways taxi drivers charge their customers. One is a meter system, the other is fixed rates. It all depends on the customer and which one he/she prefers. For local rides, meter is preferred by tourists, but when driving from one city to another, you can agree with a driver on a fair price at the beginning of the journey. There is a price list for fares between cities, though these fixed rates may vary depending on timing and vehicle size. One must be careful since sometimes these fixed rates can be higher than meter charges. In case there are some extra passengers, suitcases, or you order a taxi from far away, there can be some extra fees as well. Tipping taxi drivers is not a usual custom in Israel. If done, it is usually in a discrete way. Taxi drivers mostly don’t expect you to tip them and, without asking you, will return change. But if you received extra help (like carrying your luggage or so) or had excellent service, do not hesitate to express gratitude by tipping. A small amount will suffice. Some of the tourists tip taxis the same amount they do in their own country, but there is no rule for this. Do as you feel is right.